From the Department of Psychology (JL), Department of Behavioral Medicine & Psychiatry (RG, SC), West Virginia University, Morgantown, WV; Department of Biostatistics, University of Alabama at Birmingham, Birmingham, AL (DL). Background: Chronic pain patients are frequently treated with opioid medications in primary care, where brief measures of risk for opioid misuse have great utility. Catastrophic thinking is a clinically relevant and potentially modifiable factor associated with several chronic pain outcomes, including risk for opioid misuse. This study examined the utility of a single-item measure of pain-related catastrophizing in predicting risk of opioid misuse. Method: 119 chronic pain patients completed the Coping Strategies Questionnaire catastrophizing item, Pain Catastrophizing Scale (PCS), and Screener and Opioid Assessment for Patients with Pain–Revised (SOAPP-R). Area under the receiver operator curve (AUC) and linear regression were used to examine predictive utility of the catastrophizing item. Results: The catastrophizing item demonstrated a fair ability to discriminate those with high risk for opioid misuse on the SOAPP-R (AUC = 0.74), whereas the PCS demonstrated good discrimination (AUC = 0.85). The single item alone accounted for 30% of variance in SOAPP-R scores. Conclusion: A single question assessing pain catastrophizing has utility for predicting risk for opioid misuse. In addition, it provides the primary care provider with information on a potentially modifiable risk factor that can be addressed within the context of a brief clinical visit. In primary care settings where long-term opioids are prescribed and decisions are made regarding appropriate course of treatment, a brief measure of catastrophizing would have great utility in both assessing for risk of misuse and identifying a potential target for strategies to decrease risk by addressing a patient’s fears and maladaptive beliefs. Jensen and colleagues8 developed a single-item pain catastrophizing measure from the Coping Strategies Questionnaire (CSQ; which contains subscales addressing strategies such as catastrophizing, ignoring, and engaging in activities) to provide a clinically useful tool which retained good psychometrics. This item was selected by Jensen and colleagues based on its performance on validity indices. The aim of the current study was to further examine this single item in comparison with another well-established measure of catastrophizing, and to assess its utility in predicting risk for opioid misuse. The sample consisted of 119 chronic pain patients at an Appalachian university medical center, referred by physicians for an assessment of their qualifications and risk factors for long-term opioid treatment. The mean age of participants was 52.0 years (SD = 11.4), and the sample was 54.6% male. This study was approved by the West Virginia University Institutional Review Board. A single item was used from the CSQ, stating, “When I feel pain … It is terrible and I feel it is never going to get any better.”7 Responses range from 0 (“never”) to 6 (“always”). The Pain Catastrophizing Scale (PCS) is a 13-item measure of pain-related catastrophizing that describes thoughts and feelings that an individual may have when they are in pain.6 The PCS has been widely used, and yields good convergent validity.6 Higher scores are indicative of higher levels of catastrophizing. The Screener and Opioid Assessment for Patients with Pain–Revised (SOAPP-R) is a 24-item measure of risk for opioid medication abuse.9 The SOAPP-R demonstrates good internal consistency, specificity, and sensitivity in identifying individuals with elevated risk for medication misuse.9 Scores of 22 or greater suggest high risk for opioid medication misuse. Logistic regression was performed to estimate area under the receiver operator curve (AUC) values for the CSQ catastrophizing item and PCS in predicting elevated risk for opioid medication misuse (ie, scores >22 on the SOAPP-R). Multiple linear regression was performed to estimate R2 and partial R2 values to examine predictive utility of both the CSQ catastrophizing item and PCS. Six participants (5% of the sample) were missing data on the CSQ catastrophizing item or SOAPP-R, resulting in a sample size of 113. The AUC of the catastrophizing item for high-risk scores on the SOAPP-R was 0.74, which suggests that the item demonstrates a fair ability to discriminate those with elevated risk for opioid misuse and those without elevated risk. This is compared with an AUC of 0.85 for the PCS, which shows that the PCS demonstrates a good ability to discriminate those with and without elevated risk for misuse. Combined, use of both the catastrophizing item and the PCS yielded an AUC of 0.86 (with 6 additional participants missing data on the PCS, resulting in a sample size of 107). See Figure 1 for the full receiver operator curves (ROC) discriminating those with and without elevated risk for misuse based on the catastrophizing item and the PCS. Receiver operator curves (ROCs) predicting high risk for medication misuse on the Screener and Opioid Assessment for Patients with Pain–Revised (SOAPP-R) (scores > 22) from the Coping Strategies Questionnaire (CSQ) catastrophizing item alone, Pain Catastrophizing Scale (PCS) alone, and both CSQ and PCS. AUC, Area under the receiver operator curve. The AUC analysis of the catastrophizing item alone was used to examine possible cutoff scores. Youden’s J index is often used to select the cutoff that has the highest balance of sensitivity and specificity.10 Using a cutoff of 5 or greater for the catastrophizing item resulted in the largest J index with a sensitivity of 55.6% and specificity of 88.4%. However, we argue that sensitivity is particularly important for this item, due to the relative importance of identifying as many of those who are at greater risk for opioid misuse and the absence of any harm associated with addressing catastrophizing even in those who are not at particularly elevated risk of opioid misuse. In this case, a cutoff of 3 on this item may have more utility, with a sensitivity of 81.4% and specificity of 46.5%. Clinicians may use whichever cutoff is consistent with their particular aims. In regression, the catastrophizing item accounted for a significant amount of variance in predicting SOAPP-R score, F(1111) = 47.36, P < .001. The R2 value for the catastrophizing item predicting continuous scores on the SOAPP-R was 0.30, showing that this single item accounts for 30% of variance in SOAPP-R scores. In combination, the PCS and catastrophizing item account for 45% of the variance in SOAPP-R scores, F(2104) = 42.78, P < .001. However, when both the catastrophizing item and the PCS are both entered to predict SOAPP-R scores, the partial R2 for the CSQ item is 0.014. 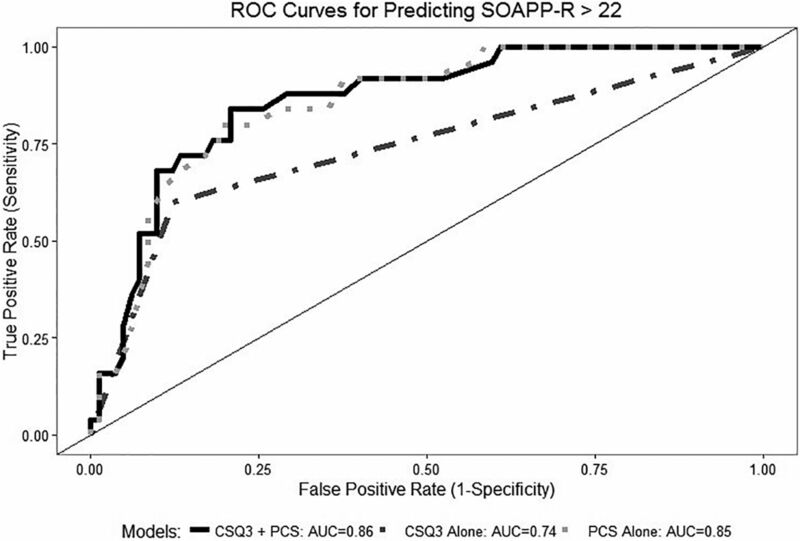 This suggests that this item does not demonstrate great incremental validity in combination with the PCS (ie, utility in predicting SOAPP-R scores above and beyond the variance accounted for by the PCS). Findings suggest that the single catastrophizing item has utility for predicting risk for opioid medication misuse among chronic pain patients in primary care. Though it does not provide incremental benefit above and beyond the PCS, the single item may be used more naturally and efficiently within the context of the clinical interview itself. Using this single question, physicians may quickly identify those at increased risk for opioid misuse and implement strategies to mitigate risk. Risk for opioid medication misuse is a complex issue for PCPs treating patients with chronic pain. Whereas comprehensive evaluation of risk is ideal and beneficial in decision making regarding prescribing11, there are often strict time constraints or limitations in access to resources than can be preventive to completing such comprehensive evaluations. In some situations, very brief screening tools can be particularly beneficial in quickly identifying individuals who are good candidates for interventions or who require further evaluation. Pain-related catastrophizing has been shown to be associated with higher ratings of pain intensity, negative emotional states and thoughts, and greater risk for opioid misuse3,6, and is an area in which PCPs or integrated psychologists can intervene to mitigate risk for opioid misuse. For example, a PCP may identify patients who are prone to catastrophizing with this measure, and intervene by providing education regarding the nature of the patient’s chronic pain complaint and providing reassurance that pain does not signal ongoing damage or injury. The PCP can further make recommendations about the importance of continuing functional activities, activity pacing, and limiting avoidance. These interventions may serve to reduce pain related distress and thereby reduce the patient’s potential to misuse medications. This study has a few limitations. First, the sample is from a behavioral medicine department, rather than primary care. Though there is likely some generalizability across these medical settings, further research confirming the utility of this measure in a primary care sample is important. Second, because this is a single-item measure, it is not possible to assess for internal reliability. In addition, at this time, we could collect only 1 measurement and could not assess test-retest reliability or sensitivity to change. Future research can use multiple times of measurement to examine reliability and sensitivity to change as providers intervene to decrease catastrophizing. This study provides a valuable first step in confirming that a single-item measure can be validly used to quickly screen for modifiable risk factors for opioid misuse. It also points to the ongoing need for further research on opioid risk assessment tools and mitigation strategies. The single-item catastrophizing measure demonstrates utility as a very brief screener of risk and possible areas for risk mitigation in time-limited settings such as primary care. To see this article online, please go to: http://jabfm.org/content/30/6/828.full. Received for publication March 13, 2017.
. Predicting opioid misuse by chronic pain patients: A systematic review and literature synthesis. Clin J Pain 2008;24:497–508.
. Predicting aberrant behaviors in opioid-treated patients: Preliminary validation of the Opioid Risk Tool. Pain Med 2005;6:432–442.
. Catastrophic thinking and increased risk for prescription opioid misuse in patients with chronic pain. Drug Alcohol Depend 2013;132(1–2):335–341.
. Risk for prescription opioid misuse among patients with a history of substance use disorder. Drug and Alcohol Dependence 2013;12(1–3)7:193–199.
. Catastrophizing, depression and pain-related disability. Gen Hosp Psychiatry 2011;33:150–156.
. The Pain Catastrophizing Scale: Development and validation. Psychological Assessment 1995;7:524–532.
. The association between catastrophizing and craving in patients with chronic pain prescribed opioid therapy: a preliminary analysis. Pain Med 2014;15:1757–1764.
. One- and two-item measures of pain beliefs and coping strategies. Pain 2003;104:453–469.
. Validation of the Revised Screener and Opioid Assessment for Patients with Pain (SOAPP-R). J Pain 2008;9:360–372.
. Index for rating diagnostic tests. Cancer 1950;3:32–35.
. Impact of a psychological opioid-risk evaluation on opioid prescribing in primary care. Fam Med 2016; 48:538–545. Re: "Predicting Risk for Opioid Misuse in Chronic Pain with a Single-Item Measure of Catastrophic Thinking"